Two City Council members say they had no idea police had been accessing footage from streetlight cameras, which were sold to the public as a tool to mitigate traffic. Now, two years after the program was implemented, police — not city officials — are writing up a policy guiding how they’re allowed to access footage and data from the cameras. Last month, top San Diego officials met with residents at the Malcolm X library to direct their gaze to the thousands of new cameras that were watching them back. It was precisely the type of community education and outreach work you might expect to take place before a big project — in this case the city’s “smart” streetlight program — is rolled out to the public. But it was happening more than two years after the City Council approved the devices, as fear began building that the footage they collect can — and is — accessed by police. City officials billed the streetlight sensors and cameras as a means of gathering atmospheric data and analyzing traffic and pedestrian flow to better understand the city’s infrastructure needs. The devices’ use as a crime-fighting tool never came up. But that’s what the approximately 3,000 cameras raised high above San Diego street corners have become. Since August, the San Diego Police Department has been accessing the raw video footage with permission from City Hall and using its contents in dozens of criminal investigations, as the U-T reported. Some of that footage could appear at a trial scheduled to begin later this month, according to police. Lt. Jeffrey Jordon, who works with Police Chief David Nisleit on special projects, confirmed that outside law enforcement agencies have requested access to San Diego’s raw video footage too, but he declined to say which ones and for what purposes. Voice of San Diego’s own request for a list of agencies that want to tap into the cameras is still pending. 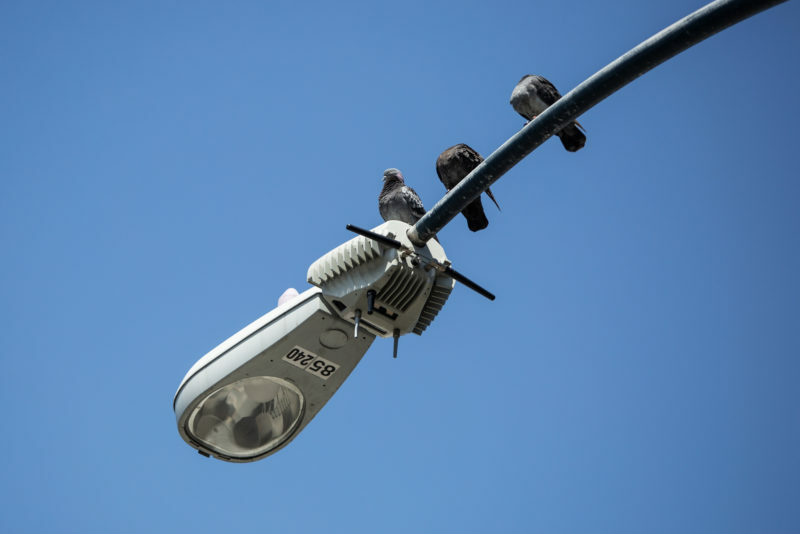 City officials argue they’ve built privacy protections into the streetlight system, which doesn’t collect personally identifiable information about passersby. While the raw video footage is stored and protected by a third party, the cameras are also running analytics and producing metadata that is publicly available for app developers. But those same officials acknowledge the growing criticism that City Hall walked backward into this awkward situation, embracing new technologies without fully appreciating their power and without writing adequate rules on their use. While City Hall might have only been interested in counting cars, the Police Department is not. Yet the department’s access to the technology and potential limits on that access was never a part of the discussion when the City Council approved its use. The story of how San Diego teamed up with a major corporation to retrofit thousands of streetlights to monitor traffic flow and meet its climate change goals is also a story of the benign way that cities can inadvertently open a backdoor to surveillance. Caldwell said he and others would like to hold more community meetings beyond the one last month, because the more the public learns about the streetlight technology, the less frightening and invasive it should seem. As government employees from across the globe meet in San Diego this week to consider how data captured in public rights of way might improve the urban landscape, community activists and elected representatives are confused about how we got here. City Councilmen Scott Sherman and Chris Cate, who both voted in favor of the retrofitted streetlights in 2016, said they were unaware that police had been accessing the cameras until Voice of San Diego contacted them. And while they said they thought the footage could be a useful law enforcement tool with the right amount of oversight, they were disappointed that they didn’t know about the surveillance capabilities of the project from the beginning. Sherman blamed a culture at City Hall at that time of dropping major proposals last-minute and then pressuring the decision-makers to take them or leave them. Indeed, when the streetlight project went to officials, staff recommended “immediate action.” Hearings at the committee and Council levels lasted only a few minutes. “It’s exactly how you shouldn’t run a government,” Sherman said. Going forward, he wants to see regular briefings on how the information collected through the city’s streetlights is being used. So does Councilwoman Monica Montgomery, the recently appointed chair of the city’s public safety committee. She was elected in 2018, after the streetlight proposal was approved. A group called the Coalition for Police Accountability and Transparency, which is based primarily in her district, has been urging Montgomery to shed more light on the streetlights. Some have also been retrofitted with microphones, and Montgomery said she wants to know under what circumstances the audio recording devices might in the future be turned on and how they intend to employ gun-shot detection applications. “We want that full-on conversation in a public arena,” she said. The devices capable of watching and listening to San Diegans have a humble origin. In December 2016, San Diego’s Environmental Services Department presented the City Council with a way to bring down its energy costs. General Electric had been looking for a place to test out new sensor-controlled technologies that could brighten or dim lights from afar and collect anonymized data, and a pilot program had been initiated in East Village two years prior. The company was now offering to finance the installation of that technology across the city with a $30 million loan that could be paid back over 13 years through its own energy savings. In other words, the project would cost nothing, or next to nothing. Clearly, the technology had the potential to do more than dim lights. But few people were talking about it. Cate said he remembered the surveillance capabilities of the streetlights coming up at a briefing with city staffers and being assured that law enforcement couldn’t access the raw video footage. “I was told that data and information is housed under another company,” he said. It is. But it was incorrect to suggest the raw video footage would be forever out of reach. The San Diego Police Department began to realize this the following year — after GE had begun touting its project here as the biggest “Internet of Things” rollout in the world. Still, police leaders didn’t seek access to the cameras until mid-2018, following a homicide in the Gaslamp. From that point on, Jordon said, he was “hooked” on the technology — even if the cameras aren’t always located in the most convenient places for investigators. At the same time, he knew he needed to draft guidelines for how police could access and review the footage. He consulted colleagues in other cities and in March, the police department posted a memo to its website outlining those procedures. It is, Jordon said, “a living document” that will change over time, as more feedback from the community and City Council members flows in. He conceded he’s not a technological expert, but he’s willing to engage in conversations about civil liberties and fully expects to be called before elected officials. The policy’s origin story presents an uncomfortable truth: SDPD, not city officials, is setting the terms for how the department should police itself as it accesses data from the streetlights — and it’s doing so long after the technology actually went into the field. At the same time, the city’s sustainability department, which is now in charge of the project, wrote up rules on its end giving the police chief the authority to determine who can review the raw video footage. Police officers seeking the footage must go through Genetech, an outside company, which keeps an access log. The footage is only available for five days and then it automatically deletes itself. The cameras are supposed to be aimed squarely within the public right of way, cannot pan or tilt and are not sophisticated enough — at the moment — to recognize faces or read license plates. To prove their commitment to transparency going forward, city officials created a website and have been uploading relevant records about the project. The meeting at Malcolm X library last month was another attempt to get in front of the criticism that’s been building at City Hall for months. The city’s streetlight cameras, mapped. Neither Hooven nor Caldwell has access to the raw video footage. They said they wanted to establish a wall of separation between the public planning and law enforcement uses of the streetlights. Activists say the city’s regulations are a good start. But they want stronger policies in writing, so that no one’s confused about how the technology should be used going forward. Seth Hall, a San Diego-based writer and technologist with TechLEAD, which is aligned with the digital rights group Electronic Frontier Foundation, said the rules in place don’t necessarily reflect the wishes of the public. Additional workshops would help, as might a board of advisers, he said. This isn’t the first time San Diegan has bumbled its way around a surveillance network. In 2010, the San Diego Police Department set out to get access to public and private cameras all over the city to deter crime, collect evidence, provide a live feed of crime scenes and identify “questionable individuals or conduct.” But the video feeds were mostly useless because they relied on software that was incompatible with the department’s operating system. The whole discussion about streetlight capabilities would be unnecessary today if San Diego had in place a policy like the one offered by the American Civil Liberties Union’s community control over police surveillance initiative. That policy is essentially a thought exercise. It requires public agencies to consider the benefits and risks of any new technologies they plan to purchase by writing upfront the regulations dictating how those devices will be used and managed. Dave Maass, a researcher at the EFF, applauded SDPD for trying to think carefully about the streetlights and soliciting outside perspectives. But the fact the project was sold one way — as a traffic mitigation tool that could save on energy costs — then used for other purposes, should give everyone pause, he said. Despite the outside complaints and the city’s own acknowledgment that it could have better informed the public about the devices’ potential uses, San Diegan officials believe they’ve established a model that could be adapted elsewhere. Indeed, one of the officials who worked with GE on San Diego’s streetlight projects, David Graham, is now working on a proposal to build out Carlsbad’s “smart” infrastructure. That city held a workshop in January. One of the exercises, the Coast News reported, involved breaking into groups and using Play-Doh so that officials could visualize city spaces. As Carlsbad’s chief innovation officer, Graham said he intends to solicit feedback from residents for another six to nine months.